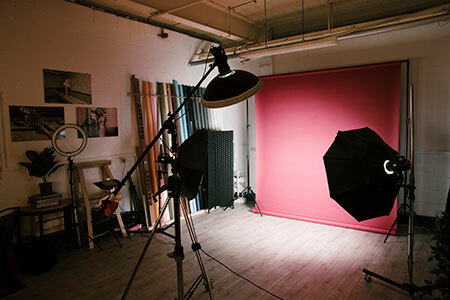 Inside The One Studio we have a variety of lighting equipment, modifiers and backdrops that you can use as part of our affordable, low cost package. 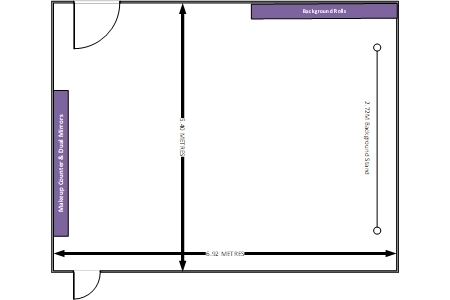 You will see all the equipment available below. 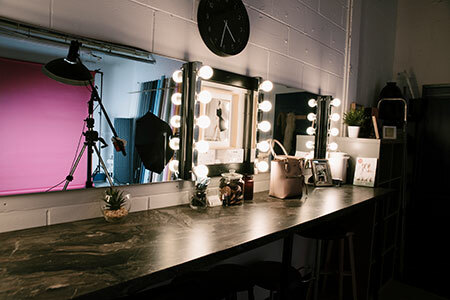 Equipment You Can Use ..
Our new makeup and styling area ..
We have endeavored to ensure that you have the very best of facilities, not only in equipment and resources but also in the provision of makeup and styling. Our new makeup and styling area provides dual makeup mirrors with bright and even lighting to ensure the most flawless of transformations. A sufficient number of power outlets allows the connection of up to four electrical appliances, while the in-built USB charging outlets allow you to give life to your all important communications devices! The floor is laminated to provide a smooth and even surface. The studio is heated in the winter and has cooling for the summer. We always have a range of backdrops in stock. You may use any of the backdrops but you need to make sure you do not damage them, including soiling or tearing. Any backdrops damaged are charged at £8.50 per metre plus VAT. Muslin backdrops must be paid for in full if damaged. These cost £80 plus VAT. So please take care of them all. If you want a special backdrop ordering we can also do this, and we will be pleased to quote you a price.